Barrel configuration is no longer a choice between perceived tradition and modernity, says Jonathan Young. The Field's Editor opens the age-old debate and gives his verdict on over and under or side by side? Barrels stacked in your favour? Over and under or side by side will be forever open for debate. While tradition has favoured side by sides, an over and under will not recieve the snide comments on a shoot as it once did thirty years ago. In fact, many guns find they shoot better with stacked barrels. So which is your preference: over and under or side by side? The Field’s Editor, Jonathan Young, opens the debate and gives his verdict. 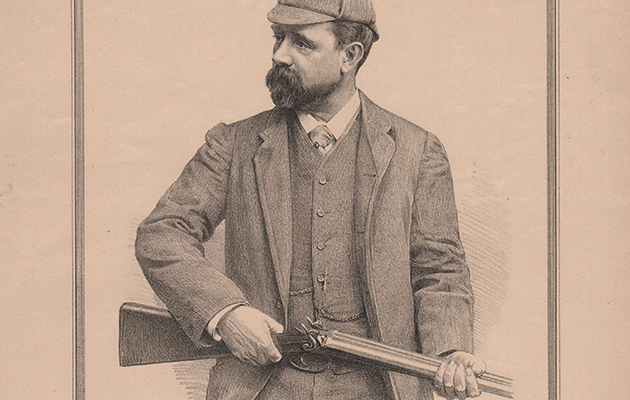 The Field has been expert in sporting matters since 1853. For more shooting, gundogs, hunting, fishing, country life, food, fine wine and great fun, take advantage of our great subscription offer. Save up to a whopping 46% today in our JANUARY SALE. Click HERE to discover more and subscribe today. Only a bad workman blames his tools, so finding the right gun is just part of the equation. Read our tips on forward allowance. 9 techniques for shooting well to master the hardest, but most important, shooting technique. Thirty years ago, those pitching up with an over and under could expect a mixed reaction, usually adverse. “Essex drainpipe”, “bank-job special” and “claybuster’s fence-post” were among the politer descriptions. Proper shooting types deployed a gentleman’s gun, which was a side-by-side, preferably inherited, old and English. This explains the conversation I had after back-gunning an extremely experienced 60-days-a-season man who’d just despatched every single bird with unusual ruthlessness. “Well, I wasn’t going to let any through to someone using one of those,” he said, with a dismissive glance at my over and under. I kept my counsel until we gathered round for elevenses, when I loudly congratulated him on his insistence on using a split-cane rod when salmon fishing. He looked blank. “But you’re a die-hard traditionalist, wedded to the ways of your grandfather. Surely you’re not telling me that you wield a nasty, modern rod made of space-age carbon fibre?” I teased. He got the point and was deeply unamused. 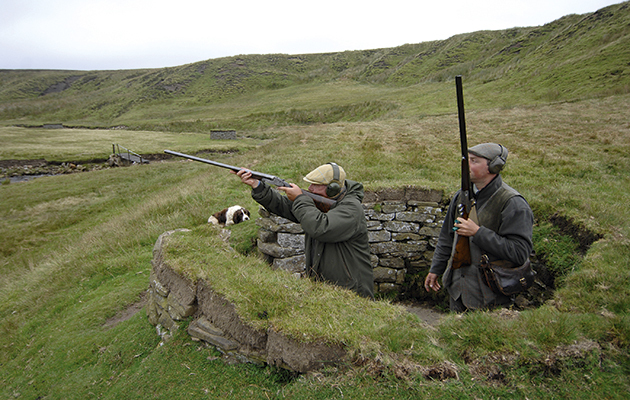 Sticking with “tradition”: shooting grouse with a pair of side-by-sides. When it comes to over and under or side by side, actually, I love side by sides and always regret selling my first double, a snaky Army & Navy hammergun with exquisite wood and honorable scars. But having lost my side by side virginity to over and unders in the mid Eighties I couldn’t now renounce them because I simply shoot better with them. And so do many others. An extraordinary number of my friends, after 30 years in the field, are now swapping to vertical barrels having seen a distinct improvement in their performance. Though some, of course, have no room for improvement, being prodigiously talented whatever the format of the gun. Two seasons ago I watched one such artist drop four wild grey partridges with four shots with a pair of 1880s sidelocks and have often witnessed a local line of experts, armed with English 12s spitting an ounce of 7s, barely miss a string of genuine 45yd pheasants – the type of bird that has so many of the over and under boys hurling 36g of 4s – and kill them as dead as Canute. But these are exceptional shots whose skills have been honed by a shooting lifetime of 50 to 100 days a season. And while most of them use traditional, 61⁄2lb game-guns, an increasing number of top shots are ordering side-by-sides more akin to the old live-pigeon guns – 7lb, 30in barrels, semi-pistol grip, 23⁄4in chambers, raised rib – with the modern refinements of Teague chokes and recoil systems, the sort of guns described by one shooting coach as “the closest you can get to a modern over and under without it actually being one”. So when it comes to over and under or side by side, why would one want a side by side that resembles an over and under? And why is every serious clay-shooting competition, including the Olympic disciplines, won by those using stacked barrels? Is it because it has inherent technical advantages that cannot be matched by a side by side? A panel of shooting experts was asked to comment on the following qualities commonly associated with over and unders. They have a single sighting plane – but why does that work when so often we’re not conscious of seeing the barrels when we shoot? They are heavier – so more akin to the old 30in-barrelled side-by-sides shot by Ripon and Walsingham and live-pigeon competition guns – and so provide more inertia for the swing and better absorption of recoil. They have big foreends, single triggers and pistol grips, so hand placement is more accurate and consistent. They tend to have 23⁄4in or 3in chambers, allowing them to cope with a wide range of loads including steel. The recoil is felt differently, so the first barrel recoil is low in the shoulder, producing less barrel flip than a side-by-side and thus allowing a far more accurate second shot. Mark Marshall of EJ Churchill using an over and under. Mark Marshall, head coach at EJ Churchill, says of the question over and under or side by side, “All these points are valid. Gun fit is definitely more important with the side-by-side: 1⁄4in too short and you get bruised on your middle finger, 1⁄4in too long and you get a bruise on your arm. Cast is also more important on a side-by-side as it’s harder to see if you are centre or not. As for ‘pointability’, if I gave someone a ruler to point at something accurately I guarantee they will subconsciously turn it on edge. After all, we point a shotgun, we don’t aim it, and I think this is a major reason for the over and under’s success. Earl de Grey (Lord Ripon) with a hammergun. “The single sighting plane of the over and under leads the eye more naturally towards the target, rather than the double expanse of barrels and rib of a side by side,” says Rawsthorne. “And while one should not be looking at the barrels during the shot, one needs to be aware of them in the peripheral vision while the central focus is on the target; the barrels of an over and under obscure less of the target and surrounding area. Ian Coley is an ex-gamekeeper, coached the 2012 Olympic shooting team and runs one of the UK’s leading gunshops and shooting grounds. “Over the past 30 years the side by side market has been decreasing. A lot of this is down to the new, modern over and unders being so much easier to shoot and, most importantly, more pleasant to shoot in terms of recoil. The typical side by side tends to be lighter, which was fine when the main cartridges used were Eley Impax 28g 6s. These are smooth and soft cartridges to shoot and were more than suitable for shoots 25 to 30 years ago. But many shoots today provide high, challenging birds and a standard 21⁄2in 28g No 6 cartridge won’t have the killing consistency at longer range provided by the modern, high-performance 23⁄4in cartridge such as Hull’s High Pheasant Extreme, Gamebore’s Black Gold and RC Sipe. Very few side by sides would be chambered and suitable for these modern-day cartridges and if they are proofed and have adequate chamber sizes for these, the recoil is too much to bear over a day of firing 250-plus cartridges,” he says. 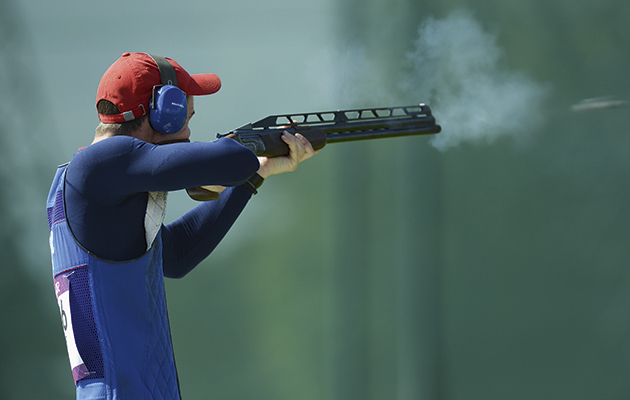 Peter Wilson uses a Perazzi to gold-medal effect at the 2012 Olympics. Edward Watson of Dr Watson Shooting adds another factor in the over and under’s favour: the relationship between eyes and barrel conformation. “Shooting is very much a ‘hand to eye’ co-ordination sport,” he says. “Your eyes watch the bird and this feeds information to your brain, which cleverly works out distance, speed and line. The focus on the bird helps this and the harder you focus the better you shoot. If, however, your eyes are prevented in any way from total focus on the target you will miss. With an over and under you have a much better view of the bird when the gun is mounted due to the gun’s single sighting plane. Our eyes are lazy and will always try and look at the closest thing, ie the barrels. And the more the barrels intrude into our vision, even our peripheral vision, the more our eyes will want to look at them and not the bird. And if you look at the barrels and not at the bird you’ll usually miss. That’s why shooting an over and under is 30% easier than with a side by side.” It seems that in the case of over and under or side by side, the over and under wins. Yet despite the apparent technical advantages of the over and under, we all know people who shoot brilliantly with side by sides. Adam Calvert, a freelance instructor, notes that they are quicker to load. 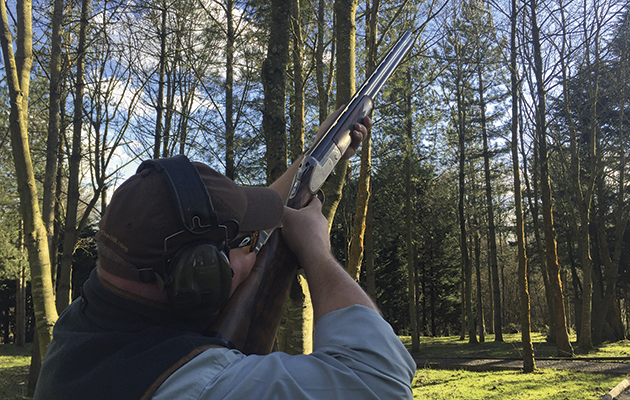 And Nigel Muir, an instructor at the Royal Berkshire Shooting School for 15 years, says that,“The main ‘problem’ with them arises when the perceived Holy Grail is ‘high birds’ where choke and cartridge choice are important. This has led to a trend for mighty guns and mighty cartridges. But have we gone too far in pursuit of this? Bar a few specialists, the pursuit of very high birds leads to demoralised shooters, injured birds and people forgetting why they are there in the first place. 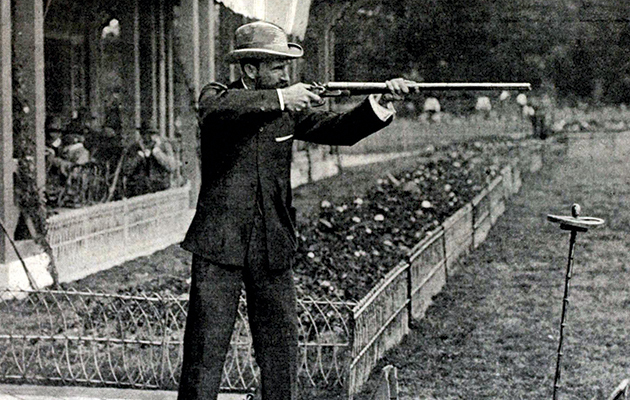 Shooting live pigeon at the 1900 Olympic Games. And nothing wrong with that, except perhaps the need to understand “tradition”. When The Field was founded in 1853, gunmaking was in the transition from muzzle-loader to breechloader and the Victorians embraced technological change, from flint, percussion cap, needle fire, central fire and hammer to hammerless ejector in the space of some 30 years. Not much hankering after “tradition” then, although the barrels remained side by side. Why should this be, given the apparent superiority of the visual picture afforded by the over and under? Why weren’t Ripon and Walsingham, both experimenters, commissioning over and unders from James Purdey & Son? Chris Price, the respected owner of Helston Gunsmiths, notes, “There were over and unders in the percussion-cap period but it was difficult to make them so that the hammers had sufficient throw and weight to detonate the cap. This was easily achieved with the side by side and the format was quickly adopted, the external hammers perfectly suited to allow all manufacturers to build good, working side by side guns. Former technical director of Holland & Holland Russell Wilkin notes that “both the side by side and over and under configurations date back to 16th century wheel locks. Sheer bulk and weight would have been the major consideration as costs must have been off the scale compared other types of portable ‘guns’. 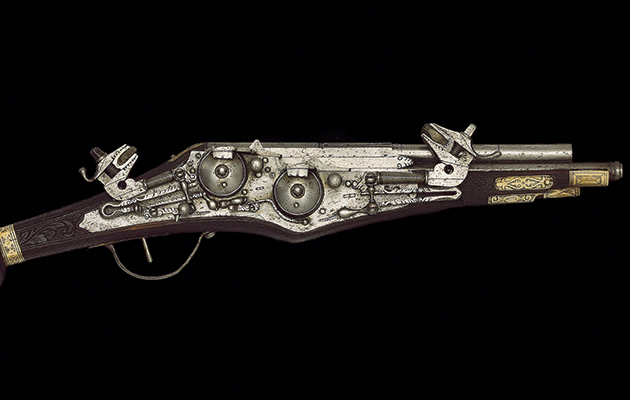 c1590, 100-bore Saxon over and under wheel-lock pistol sold by Bonhams in 2005. That subjectivity varies, naturally, with individuals but perhaps we should be chary of labelling one type of gun as “traditional” and the other as a claybuster’s upstart. Both formats have ancient pedigrees but technical problems gave the side by side a dominance that has disappeared. Thousands of extremely competent shots use side by sides to great effect while others might benefit by changing to an over and under. Whichever type of gun we choose, there’s one overriding factor: we owe it to our quarry to use whatever enables us to do our personal best to kill it cleanly in the best traditions of sportsmanship.